German Chancellor Angela Merkel (L) British Prime Minister Theresa May (C) and French President Emmanuel Macron arrive at the EU summit in Brussels, Belgium October 19, 2017. BRUSSELS - German Chancellor Angela Merkel, in a markedly positive response on Friday to an EU summit appeal by Prime Minister Theresa May for help with Brexit, said talks with Britain were moving forward and were unlikely to break down. 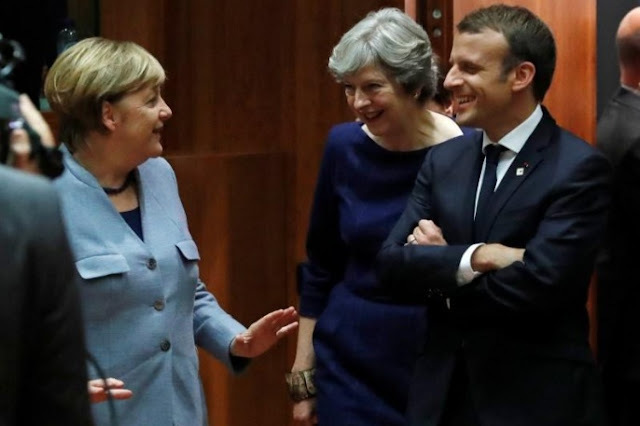 Merkel made her comments at the end of the first day of a European Union summit and after May had appealed to her fellow leaders to help her silence critics at home and break a deadlock in the talks. “In contrast to how it is portrayed in the British press, my impression is that these talks are moving forward step by step,” Merkel told a late-night news conference, dismissing as “absurd” suggestions in Britain that the talks should be broken off. “I have absolutely no doubts that if we are all focussed ... that we can get a good result. From my side there are no indications at all that we won’t succeed,” she said. Arriving for the second day, others emphasised the positive too: Maltese Prime Minister Joseph Muscat called May’s speech her “best performance yet” and “a warm, candid and sincere appeal”. Ireland’s Leo Varadkar said it was “very strong”. But others complained they had heard little new of substance and rejected May’s repetition of London’s view that demands for money from Brussels have “no legal framework”. Austrian Chancellor Christian Kern said “rhetorical progress” needed to be followed by “tangible conclusions”. After May leaves the summit on Friday, the other 27 leaders are expected to rule that there has not been sufficient progress to push the talks forward but will call on their staff to prepare for talks on a transition period that would smooth Britain’s exit in 2019. May made no comment as she arrived for a breakfast meeting with summit chair Donald Tusk. Near midnight, speaking at the end of a dinner of butternut squash gnocchi and pheasant, she had sought to calm fears Britain would use its departure in March 2019 to undercut the EU economy by lowering standards. She appealed to EU leaders to respond in kind to her efforts to break the Brexit stalemate, making clear she was disappointed at their plan to announce on Friday that talks have not yet made enough progress to move on to a discussion of future trade ties. Merkel said the three had been discussing the need to safeguard the Iran nuclear deal after U.S. President Donald Trump’s decision last week to “decertify” it. It was a response May was looking for after explaining over dinner the “difficult political background” she faces if she returns home empty-handed and how she had worked hard to get the talks back on track after realising their perilous state at the end of the summer. “I took stock, listened to what the people in the UK were saying and what my friends and partners in Europe were saying and I made a step forward,” she was quoted as saying by a British official, referring to a speech she made in Florence on Sept. 22. Weakened after losing her Conservatives’ majority in a June election and by failing to rally support at a party conference, May needs to keep the talks on the road to silence the voices calling for her to walk away from the negotiations. Unwilling now to increase her offer on the divorce bill, May instead proposed more moves to protect the rights of EU citizens in Britain -- one of three issues the bloc says must be settled before moving to discuss a future trading relationship. German Chancellor Angela Merkel, in a markedly positive response on Friday to an EU summit appeal by Prime Minister Theresa May for help with Brexit, said talks with Britain were moving forward and were unlikely to break down.